"The Hitcher" begins and ends with the same sound: a match being struck, flaring into flame. At the beginning of the film, the sound is made by the villain, a hitchhiker who is a mass murderer. At the end of the film, the sound is made by the hero, a young man whose life has been spared so that he can become the special victim of the hitchhiker. The movie seems to be telling us, by the use of the sounds and in several other ways, that the killer and the hero have developed some kind of deep bond through their shared experiences. The victim's identification with his torturer is not a new phenomenon. In many of the hostage cases in recent years, some of the captives have adopted the viewpoints of their jailers. What is particularly sick about "The Hitcher" is that the killer is not given a viewpoint, a grudge, or indeed even a motive. He is deliberately presented as a man without a past, without a history, who simply and cruelly hurts and kills people. Although he spares the movie's young hero, he puts him through a terrible ordeal, framing him as a mass murderer and trapping him in a Kafkaesque web of evidence. At the end of the movie, there is, of course, a scene of vengeance in which the two men meet in final combat. And yet this showdown does not represent a fight between good and evil, because the movie suggests that there is something sadomasochistic going on between the two men. The death of the villain is not the hero's revenge, but the conclusion that the villain has been setting up for himself all along. This unhealthy bond between the young hero (played by C. Thomas Howell) and the older killer (the cold-eyed Rutger Hauer) is developed in a movie that provides a horrible fate for its only major female character. As Howell flees down empty desert highways from the violence of Hauer, he is befriended by a young waitress (Jennifer Jason Leigh). She believes that he is innocent and goes on the run with him. But the movie does not develop into a standard story of teenagers in love. And the Leigh character's death - she is tied hand and foot between two giant trucks and pulled in two - is so grotesquely out of proportion with the main business of this movie that it suggests a deep sickness at the screenplay stage. There are other disgusting moments, as when a police dog feasts on the blood dripping from its master's neck, and when Howell finds a human finger in his french fries. 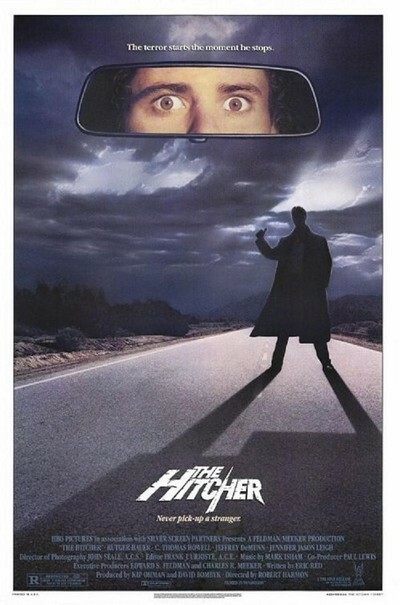 "The Hitcher" grants the Hauer character almost supernatural powers. Although that makes the movie impossible to accept on a realistic level, it didn't bother me. I could see that the film was meant as an allegory, not a documentary. But on its own terms, this movie is diseased and corrupt. I would have admired it more if it had found the courage to acknowledge the real relationship it was portraying between Howell and Rutger, but no: It prefers to disguise itself as a violent thriller, and on that level it is reprehensible. 'Rosemary's Baby' remake aborted; God not dead?